Home > Metro Shelving > Metro Turnout Gear Rack > Metro Mobile Turnout Gear Rack 24" x 72"
Metro Mobile Turnout Gear Rack 24" x 72"
The Metro Mobile TurnOut Gear Rack provides safe organized storage and open-air drying for protective clothing, helmets and boots without risking damage to high-tech fabrics. This strong and rigid Super Erecta open-wire design allows free circulation of air and a greater visibility of stored items. The Super Adjustable shelves can be repositioned at precise 1" (25mm) increments along the length of the posts. Pressure-fit shelf dividers may be positioned anywhere along the length of the shelf. This unit is designed to accommodate (6) complete sets of gear with a total weight capacity of 1200 lbs. (544kg). 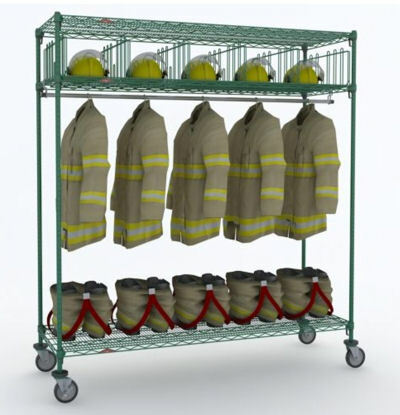 The TurnOut Gear Rack has a Metroseal 3 finish. This is a multi-layer corrosion resistant finish consisting of a proprietary cross-linked thermoset epoxy enhanced with Microban antimicrobial protection over a zinc chromate coating. Metroseal 3 with Microban provides protection from bacteria, mold, mildew and fungi build-up that may cause odor, stains and product degradation. Additionally it displays excellent abrasion, gouge and chemical resistance properties. Metroseal 3 is intended for use in damp environments and has a 12 year limited warranty against rust formation. - (2) Metro swivel polyurethane casters 5"
- (2) Metro swivel/brake polyurethane casters 5"